A simple spritz to smelling sweet! What is Pure-n-Fresh Breath Spray? How has Pure-n-Fresh Breath Spray helped others? What does Pure-n-Fresh Breath Spray contain? How do I use Pure-n-Fresh Breath Spray? Oral hygiene is arguably one of the most important areas of maintenance in the body and daily oral care is important. Teeth should be brushed twice a day (in the morning and last thing at night) and flossing should be done after each main meal. Alcohol and smoking should be limited and refined sugars should be avoided. It is important to visit your dentist twice a year. Onions, garlic, certain meats and fish, may be particularly pungent and should therefore be avoided. Coffee and tea are also culprits due to acidity, so try to limit intake of these drinks and opt for herbal teas instead. Eat plenty of fruits and fresh vegetables and make sure you get the required amount of Vitamin B, Vitamin C and Zinc. Water flushes the system – so drink 8 glasses of water per day (this includes herbal teas). Natural remedies have been studied for many years for their ability to support oral hygiene. (MacDonald, R. “Cleansing with Common Weeds”. 2003; Alive: Canadian Journal of Health & Nutrition (245):50-52.) (Lin LZ, Lu S, Harnly JM. “Detection and quantification of glycosylated flavonoid malonates in celery, Chinese celery, and celery seed by LC-DAD-ESI/MS”. J Agric Food Chem. 2007 Feb 21;55(4):1321-6. Epub 2007 Jan 25. PMID: 17253711) Recent studies indicate the soothing potential of this herb. (Mencherini T, Cau A, Bianco G, Della Loggia R, Aquino RP, Autore G. “An extract of Apium graveolens var. dulce leaves: structure of the major constituent, apiin, and its anti-inflammatory properties”. J Pharm Pharmacol. 2007 Jun;59(6):891-7. PMID: 17637182). Pure-n-Fresh Breath Spray has been especially formulated using natural herbal and homeopathic ingredients especially chosen to support freshness in the mouth. 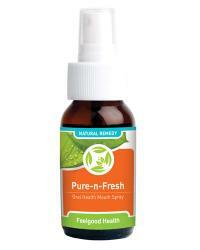 Regular use of Pure-n-Fresh Breath Spray will help to support healthy teeth, gums and fresh breath – the natural way. It is recommended that Pure-n-Fresh Breath Spray be used together with our HaliTonic to promote fresh breath from the inside (on a cellular level) as well as the outside. Using these two remedies together gives you combined support. Peppermint oil – this pleasant smelling oil has been studied for its potential to support human health in general. (McKay, D. L. and Blumberg, J. B. “A review of the bioactivity and potential health benefits of peppermint tea” (Mentha piperita L.). Phytother Res 2006;20(8):619-633). Thyme tr – One of thyme's main constituents, thymol, is used in many mouthwashes. It has been investigated for its ability to support the mouth and oral hygiene (Baca P, Munoz MJ, Bravo M, et al. “Effectiveness of chlorhexidine-thymol varnish for caries reduction in permanent first molars of 6-7-year-old children: 24-month clinical trial”. Community Dent Oral Epidemiol 2002;30(5):363-368). Echinacea angustifolia tr - has become famous for its ability to support the body’s immune system. Clinical research supports the effectiveness of Echinacea as an excellent immune system tonic. (Mishima, S., Saito, K., Maruyama, H., Inoue, M., Yamashita, T., Ishida, T., and Gu, Y. “Antioxidant and immuno-enhancing effects of Echinacea purpurea”. Biol.Pharm.Bull. 2004;27(7):1004-1009. Pure-n-Fresh Breath Spray contains no gluten, artificial flavours, colours or preservatives. It is suitable for vegetarians and safe for all ages. Shake bottle before use. Spray one or two bursts into the mouth 3 - 5 times daily as needed. May be used with HaliTonic tablets or Oral Assist Abscess Dr.
Safety during pregnancy has not been determined. Keep out of reach of children. Pure-n-Fresh Breath Spray will get to work right away to support fresh breath and oral health upon the first dose, continuing with ongoing use. Each bottle of Pure-n-Fresh Breath Spray is 50ml and depending on frequency of use, should last between 3-4 weeks. Spray for fresh breath plus internal remedy to lessen inflammation!